It amazes me that sometimes, in my internet wanderings, when I am trying to find little nuggets of fact amidst the fog of the past that might embroider my novels with authentic detail, Google presents me with nothing exact. I mean, it’s rather obvious that Google and Wikipedia and all other random, non-authoratitive sources, might present one with unexpected ‘facts’. Sometimes they present one with outright lies, and this is often the cause of amusement. Only today I was amazed to see someone on the internet declaring their casting off of pleasure driven pursuits such as drinking and eating bad food as they had decided to, ‘pursue a more hedonistic lifestyle’…I mean, there really is no answer for that except a pained inward groan. Then one allows oneself a little titter of amusement…until one makes a similar blunder and realises we all make mistakes and one ought to get down off one’s proverbial high horse. Anyway, I am becoming distracted. What I am meaning to talk about is Bath. You see, I am in the throes of writing another book, which I have been enjoying immensely, and after taking a breaking because of, well, life, I have come back to it. I was getting frustrated because I had forgotten what I had already written, and felt as though I had lost the firm grasp on my characters I had. So I spent this morning re-reading what I had already written, remembering who I had created and where they dwelt, and thinking onwards onto what I wish to write next, and I was considering what activities my character might take up. They’re staying in Bath, you see, the first time one of my books has taken place in this beautiful watering hole of the 18th century, and so I did what any modern-day historical romance writer might do (but not admit to of course), I went to Le Google. I typed in the most pragmatic of phrases, ‘Things to do in 18th Century Bath’ and was greeted with, well, not much – nothing exact, you see. You’ll be happy to know, those of you considering plan﻿ning little trips away in 2017 already, that there are a plethora of guides on what to do in modern day Bath. But, believe it or not, in the onslaught of online information, no article matched my expectations. So I’ve written one. I do that with books too, if I can’t find what I want to read in a bookshop, I’ll go home and attempt to write what I am desiring instead. Sometimes it even works. I did the same with my Things to do in 18th Century London post. I wanted to find activities that took place during the daytime that a man and woman might both attend. After all, despite what many historical romances might teach you (and I love them all), it wasn’t just about balls and gaming hells in London. And neither was Bath confined to taking the waters and the Assembly Rooms. That’s right, it wasn’t all about the nighttime Assembly’s in Bath with the dancing and light suppers presided over by Beau Nash, master of ceremonies. Oh, no, during the day one could enjoy an afternoon tea in respectable surroundings with relatives, friends or even potential lovers. Visit Bath is keen to establish that Jane Austen herself enjoyed afternoon tea at the Assembly Room’s, so there really is no arguing with that, is there? And for those hailing from countries where afternoon tea isn’t tradition, it usually consisted of tea, the drink, and light refreshments of both the savoury and sweet kinds. 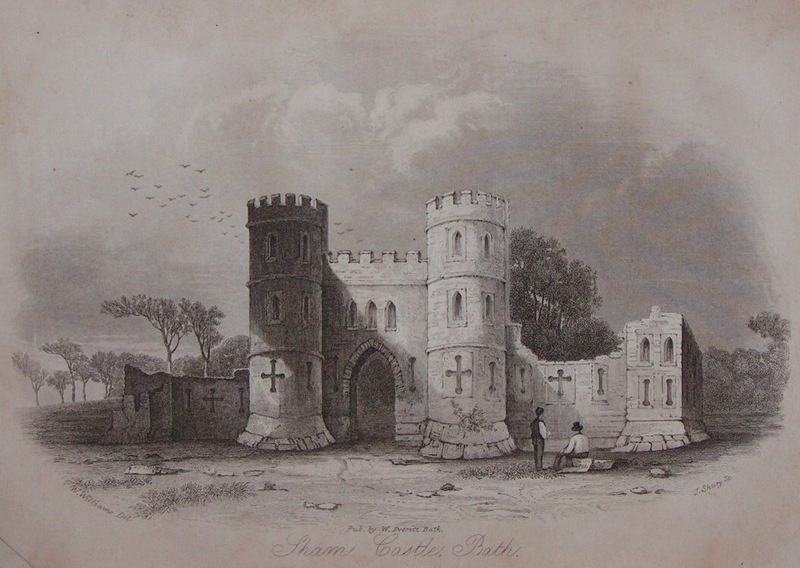 It wasn’t just Vauxhall and Ranelegh in London that could provide lovers with a useful tryst spot, Bath had a few spots of its own. Lover’s Lane, common parlance for the Gravel Walk (some of you might remember from the touching final get-together in Persuasion’s film adaptation), was a handy walk often used by those under cupid’s sway. And of course, Bath wasn’t short of gardens in which two young people, or older for that matter, might become lost. 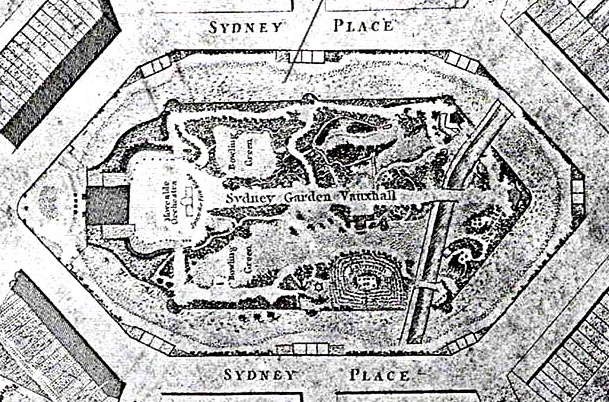 Sydney Gardens, situated behind Jane Austen’s Bath abode (though it must be stated she wasn’t fond of the city unlike myself), was a case in point. Lots of these gardens not only had lovely little winding walks, but also bowling greens and lots of little things they could o. The Hyde Park of Bath, this place was ideal for showing off one’s gladrags, perhaps obtained from Milsom Street, the popular shopping street in Bath, and overlooking the beautiful grey/yellow bath-stone city. 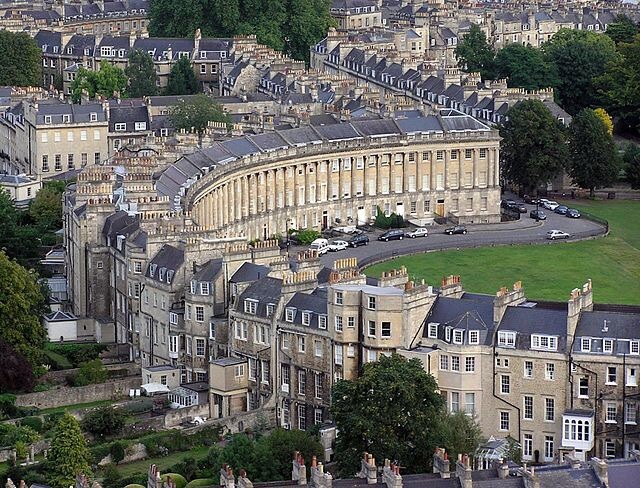 For those unfamiliar with Bath, the Royal Crescent is a stunning panoramic crescent of matching Bath stone terraced houses in a palladian style overlooking the city. It’s aesthetics are beautiful for their uniformity, classical lines, and prominent position. My favourite part of these buildings is the modern-day birds-eye view which shows the higgeldy-piggeldy backs of these houses where successive owners have made their own changes and extensions to the properties without harming the matching fronts. 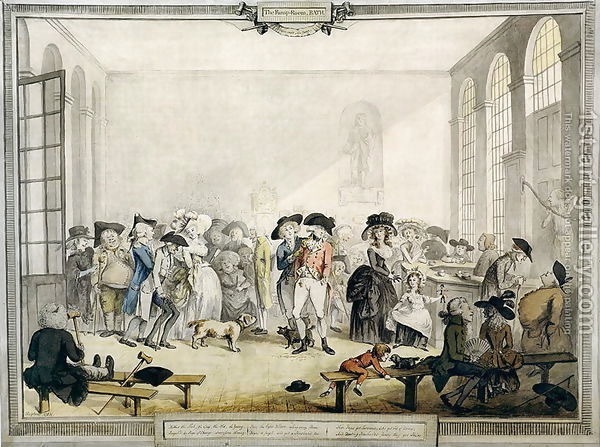 Funnily enough, 18th century people weren’t all that foolish as we might like to think in our modern state. They really were onto something with the water – containing 43 minerals, it certainly has a tangy taste (I’ve tried it) and some health benefits too. Taken from the Thermae Bath Spa’s website. For those who have been to Bath, you might have remembered looking up above the city and seeing a medieval castle, a shell of bygone days, looking down on the predominantly Georgian city. Perhaps you even thought, ‘Oh, jolly good, I’ll get my medieval rocks of while I’m here and pop up to those ruins.’ Well, you’d be out of luck. The castle is a sham. Sham by name, sham by nature, this folly was constructed on local gentleman Ralph Allen’s estate to add some glam to the place, in fact, it was pretty common practice in the later eighteenth century to ornament your gardens with extra, more ‘picturesque’ bits and pieces like follys and rotundas (the latter sees a good example at Petworth House in Sussex). Some even went as far as getting in a hermit to live in their grounds and drag them in for a hot meal when conversation at dinner was a little slow…I kid you not. Previous postFool Me Twice has Launched! I’m not sure how much of an attraction it would have been, but at the end of 1810 the Kennet and Avon Navigation was being completed for those of engineering bent. [and for people who aren’t canal enthusiasts, a navigation is the widening/deepening and adding locks to an existing waterway, whereas a canal is a newly-cut channel]. It vied for news in the papers along with the death of Princess Amelia.